Looking at the top of the diagram, this information corresponds to what many people refer to as the Business Model. It corresponds to the Enterprise Context level. Since this information is part of the Direction domain, the specific ontologies used are defined in POED. Any metamodels actually used, can be very business dependant (and dependent upon the C-Suite’s experience) but typically utilise things like the Business Model Canvas (BMC) as illustrated here. On the right we can see the Structural information represented at different levels of Idealisation/Realisation, with names that are commonly used to refer to parts of it. ¨ The Operating Model corresponds to the Contextual level of MACE. It defines the highest level structural view of the Enterprise, required to enable the Business Model and deliver the objectives defined in the Business Motivation Model. ¨ The Capability Model corresponds to the Conceptual level of MACE. It defines the fundamental capabilities required to support and enable/operationalise the Operating Model. ¨ The Solution Architecture corresponds to the Logical level of MACE. It defines (for each solution/project) the logical designs. ¨ The Detailed Design corresponds to the Physical level of MACE. It defines (for each solution/project) the physical designs. ¨ The Operational Design corresponds to the Operational level of MACE. It defines the actual things being rolled out, including the CMDB which represents a model of all the IT that is being rolled out. On the left we can see the Transformational information represented at different levels of Idealisation/Realisation, with names that are commonly used to refer to parts of it. ¨ The Business Motivation Model corresponds to the Contextual level of MAGMA. It defines (at a high level) what the Enterprise wishes to achieve (Ends), and how it proposes to achieve them (Means). ¨ The Roadmap Model corresponds to the Conceptual level of MAGMA. It defines the actions that must be taken to structurally change the Enterprise from the current Structural state, through Intermediate Structural states, towards the Target Structural state. The remaining levels of Transformational information (as defined by MAGMA) tend to be considered more in terms of the type of information existing rather than centred around the levels themselves. People generally talk of Requirements, Plans, Principles, Metrics and (hopefully, but not generally) the Rationale for decisions. ¨ Requirements correspond to the Logical to Operational levels of the Motivation part of MAGMA, and provide more and more clarity about what is driving the Transformation. ¨ Project Plans correspond to the Logical to Operational levels of the Actions part of MAGMA, and provide more and more clarity about how the transformation will be executed. ¨ Principles, Policies & Standards correspond to the Logical to Operational levels of the Guidance part of MAGMA, and provide more and more clarity about what guides how the transformation. ¨ Metrics correspond to the Logical to Operational levels of the Measures part of MAGMA, and provide more and more clarity about how we are measuring progress and success. ¨ Decision Rationale correspond to the Logical to Operational levels of the Assessment part of MAGMA, and provides more and more clarity about the decisions that have been made and why. 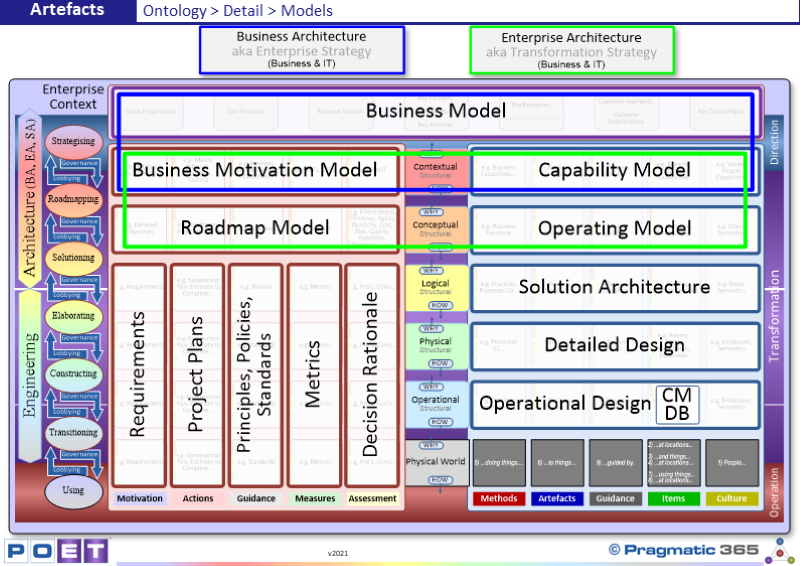 ¨ The Enterprise Strategy (shown with a blue line), which consists of the Business Motivation Model and Operating Model set in the context of the Business Model. ¨ The Transformation Strategy (shown with a green line), which consists of the Roadmap Model and Capability Model, set in the context of the Business Motivation Model and the Operating Model. Where does your Enterprise’s Business Model, Business Motivation Model, Operating Model, Roadmap and Capability Model fit into your Enterprises Transformation domain? Do you have the required basic information, in a usable format, to allow your Enterprise to produce the Business Motivation Model and Operating Model? Do you have the required basic information, in a usable format, to allow your Enterprise to produce the Roadmap and Capability models?